While we all wax poetic about moss every now and then Jeff Lowenfels recently captured the heart of true fascination with all things bryophyte in the Anchorage Daily News. It seems that unless you grow bonsai, the appearance of moss on the surface of the soil of an indoor plant is cause for alarm. 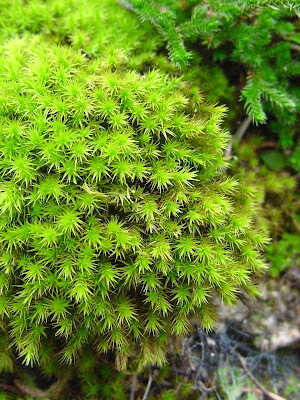 This is probably because garden columnists note that mosses like acid soils and are an indication there is something wrong with the soil and the plant needs to be repotted in fresh stuff. Yet, clearly, when grown in a proper container, they make wonderful plants, small, bonsai fields and meadows. If you have enough moss, placing it around the base of some of your houseplants will really produce a more natural looking plant. Moss can also be grown indoors on rocks for quite an effect. Has anyone tried growing moss at the bottom of a house plant? I would love to replace the coarse sand at the bottom of my Fiddle Leaf Fig Tree with moss, but have only grown moss in terrariums. Seems as if it might be a bit dry for moss, no? It would probably be worth a try- scotch moss and the like might be adept to drier conditions?